Papua New Guinea is the only country in the world that considers Rugby League its national sport. During a year spent working for a Rugby League-based community development program in PNG, Joanna Lester witnessed the sport’s potential to change attitudes, and unite an often divided nation. Papua New Guinea is famously home to more than 800 languages, but there is one that is both understood and embraced from the highlands to the islands – the language of Rugby League. This struck me on a visit to East New Britain Province last year as I walked through a village in the shadow of the infamous Mount Tavurvur volcano and came across a group of young boys playing in the dust, shouting excitedly in their local language. The topic of conversation soon became clear thanks to two words that are the same in every language – Billy Slater. As these children analysed the Melbourne fullback’s importance to the Storm’s premiership hopes in this volcanic ash-lined village, I suspect thousands more Papua New Guineans across the nation were doing exactly the same thing in dozens, if not hundreds, of tongues. It was an encounter that perfectly illustrates why Rugby League is such a powerful force in PNG. Its popularity is universal, and it brings people together in a country where so much else divides them. Rugby League has been a consistent influence in the relationship between Papua New Guinea and Australia for more than half a century. Australians introduced the sport to PNG, where it took on a life of its own. Now, Australia’s NRL competition and State of Origin series are more popular in PNG than in Australia. NRL jerseys are a national uniform, and Papua New Guineans pride themselves on their encyclopaedic knowledge of the sport and its superstars. The highlight of PNG’s Rugby League calendar is an annual clash against an Australian select side, the Prime Minister’s XIII. The experience is a much-needed eye-opener for the visiting Australian players, many of whom have little perspective of the popularity of the sport outside their own country. While Australian Rugby League has long enjoyed a following in PNG, since 2014 PNG Rugby League has developed a foothold in Australia thanks to the PNG Hunters, the only overseas team in the Queensland Cup competition. Bob Cutmore, the Australian-born CEO of the Papua New Guinea Rugby Football League, which manages the Hunters, believes the team is cultivating a sense of national pride among Papua New Guineans who would normally identify with their home province, rather than their home country. I first witnessed the power of League in PNG in 2009 when I visited Port Moresby to report on the Pacific Cup. It was clear there was huge potential to harness the popularity of the sport for development outcomes. 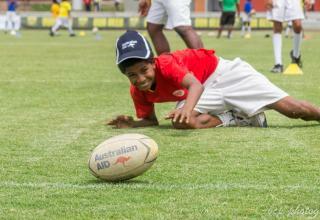 That potential finally began to be realised in 2013 with the launch of League Bilong Laif (League for Life), a sport-for-development program that uses Rugby League as a basis for school and community activities. The program comprises outdoor and classroom sessions (normally delivered in a six-week block), features Rugby League-themed reading resources, and promotes messages of respect, inclusivity and the importance of education. 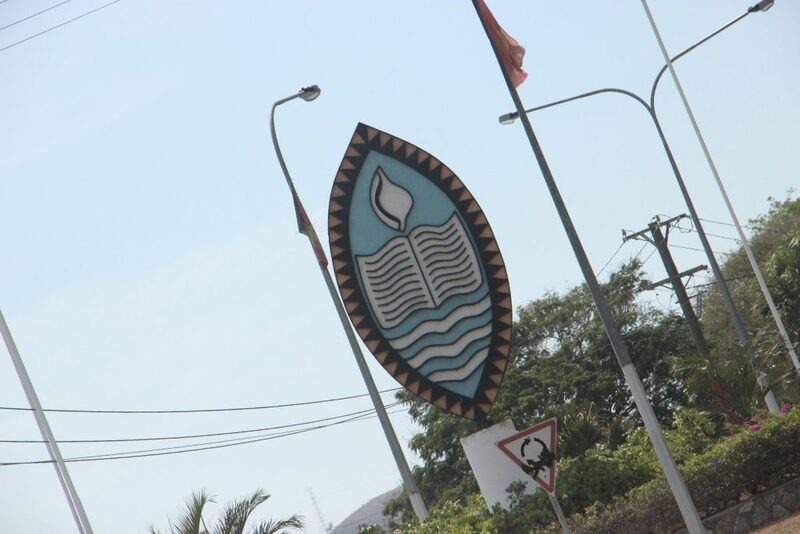 When the opportunity arose in 2014 to work in a media and communications capacity-building role with the League Bilong Laif team, I once again packed my bags for Port Moresby. League Bilong Laif is run by Papua New Guineans employed by Australia’s NRL, and is funded by the Australian Government through its aid program. The team is headed by Mark Mom, a former player and coach of the PNG national side, who also starred for Canberra Raiders in the 1990s. As the program enters its fourth year, more than 57,000 people across four regions have participated inLeague Bilong Laif activities. Mom says the program is taking Papua New Guineans on a journey that he and his staff have travelled – from seeing Rugby League as mere entertainment to realising its potential as a development tool. One of the most striking results of the program has been a growing realisation among children, teachers and parents that Rugby League is ‘not just a man’s game’. In a country with staggering rates of gender-based violence, seeing women in unexpected roles (such as teaching, playing and coaching Rugby League) seems to be having a wider impact on perceptions of women in society, and changing girls’ own views about what they are capable of. The success of League Bilong Laif has helped drive a greater understanding of sport-for-development in PNG. This is also thanks to a number of other sports investing in similar programs, and the 2015 hosting of the Pacific Games in Port Moresby, which prompted new national dialogue about the role of sport in the community. There is undoubtedly room for improvement. 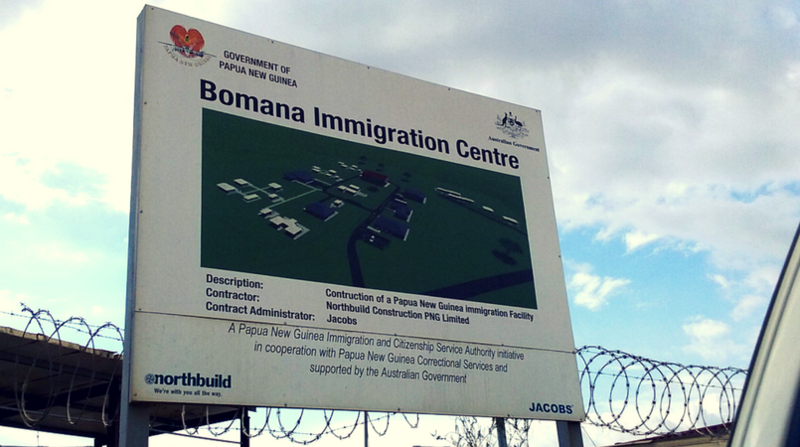 Many in the sport-for-development sector in PNG would like to see sports working more closely together, complementing each other’s offerings, and achieving wider community impact through collaboration, rather than double-ups. 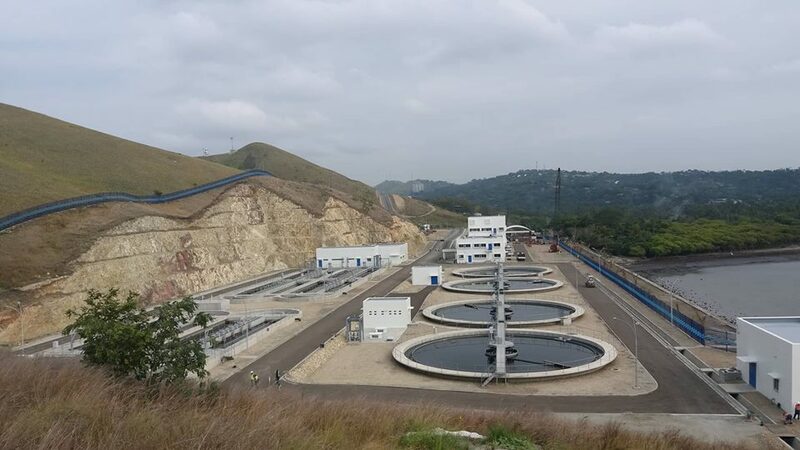 With many programs currently reliant on vulnerable government funding, the need to explore private sector partnerships is also pressing. 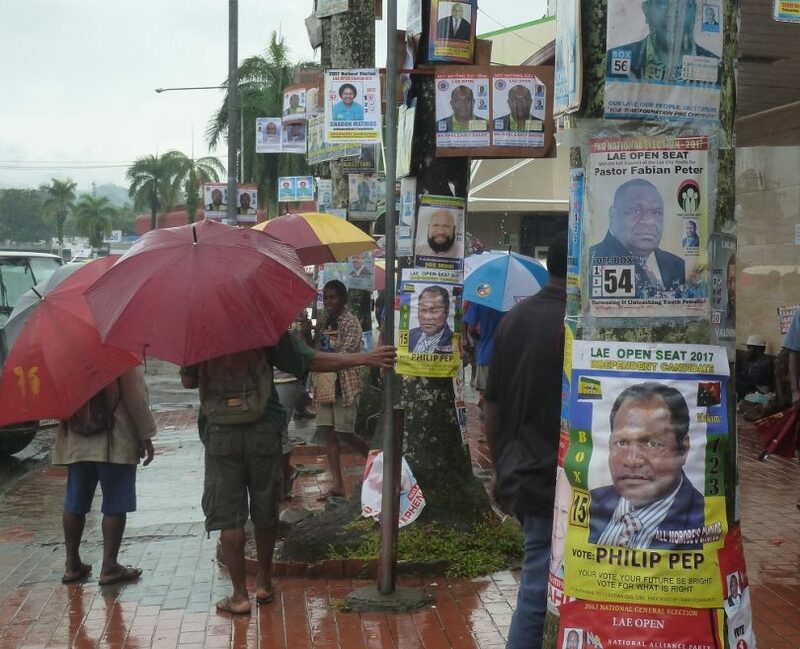 Two upcoming major events in PNG could provide the platform for such opportunities. In November 2016 the country will host the FIFA U20 Women’s World Cup and, a year later, PNG will co-host the 2017 Rugby League World Cup with Australia and New Zealand. While sport remains in the spotlight, the opportunity to channel its popularity for development outcomes has the best chance of succeeding. The onus is on sports authorities and funding partners not to waste it. Joanna Lester is a journalist and media specialist focussed on sport and Pacific affairs. 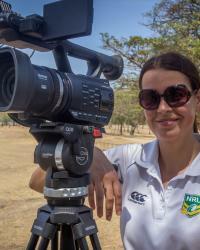 She first visited Papua New Guinea to report on Rugby League in 2009, and worked as a Media and Communications Advisor for the NRL in PNG from 2014 to 2015.